Everyone has to shop for something or other. A lot of Chihuahuas enjoy going shopping too. We get to spend more quality time with our human, and maybe even get a treat. We don’t talk back, we listen and can give good advice on what to buy. It’s easy to shop at pet stores with your Chi. We are usually welcome and an occasional accident it not a big deal. Plus there are so many things you can buy us, from treats to toys. What about other stores? It depends on the store and what you can get away with. If you’re carrying a little, well-behaved Chihuahua, you can probably sneak into a big box store that doesn’t sell food without too much difficulty. Places such as building supply stores, electronic stores and even office supply stores may overlook a furry Chi. While you can walk your Chi on a leash in pet stores, I wouldn’t recommend that in any other store. Carry your Chi, either in your arms or in a carrier. I have been to Office Depot, Staples, Home Depot, Lowes, and a few small stores I can’t remember. I hear Target does not allow pets. Some people even place their Chi in a shopping cart. But I wouldn’t try getting into a supermarket. They sell food and will most likely not appreciate you bringing in a dog of any kind (except seeing-eye dog). Something about health laws. If your Chi is a paid service dog, be ready to prove it. Small stores are also a good place to bring your well-behaved Chi. My daddy has taken me into card stores, clothing stores, chain stores and even a Las Vegas casino. I couldn’t gamble though. A popular big name chocolate candy store would not let me in. There seems to be a policy of no pets allowed amongst the chocolates. It’s not like we’re allowed to eat chocolate anyway. Store owners are anxious for your business. They will overlook a friendly and cute Chihuahua. But not everyone will, so use some discretion and call ahead. It can be embarrassing to be kicked out of a store in front of others. Shopping should be fun. Why not take your little furry Chi with you to make it an even better experience. 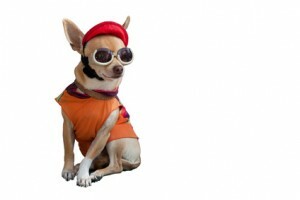 And don’t forget to stop at some friendly outdoor cafe for lunch or a snack with your Chi. Be careful. Some people actually don’t like Chihuahuas or any other animals and may cause a ruckus. Stay away from the dog haters. Feel free to share your experiences shopping with your Chi. And don’t forget to subscribe to our exciting e-newsletter. I’ll be sharing my experiences too.